I got this Dell laptop loaded with MS Vista. My company's softphone software doesn't work with Vista so I had to do a clean install of XP Pro. Everything worked fine except the drivers for everything will not work. I went to the Dell site and DL'ed the correct drivers I needed, installed them in the laptop and nothing. The drivers say they install correctly and all that but they still don't work. Does anyone know if Dell does something to the bios? Or if there is a problem to that extent? Anyone who knows anything about Vista and this problem please help me out. Thanks a lot. I know that the drivers I got were correct. I first tried the drivers from dell, then I went to the hardware makers site and tired those drivers also. I then downloaded the system software that came with the laptop from the dell website because my disc didnt seem to work quite right. I have called dell and gone through their troubleshooting steps and nothing seems to work. I know that the drivers I got were correct. I first tried the drivers from dell, then I went to the hardware makers site and tired those drivers also. I then downloaded the system software that came with the laptop from the dell website because my disc didnt seem to work quite right. I have called dell and gone through their troubleshooting steps and nothing seems to work. Thank you for the post. The employee just inst going to have a softphone. I restored the image and put everything back. I dont have time to mess with it anymore. Hopefully next time I have to do this your suggestion will work. Thanks again. Thank you for the post. The employee just inst going to have a softphone. I restored the image and put everything back. I dont have time to mess with it anymore. Hopefully next time I have to do this your suggestion will work. Thanks again. As far as my knowledge concern all windows product have backward compitibility soo if vista is working fine that mean your laptop is compitible with xp pro. there must be some installation issue other wise everything is fine. try this at command prompt ' DriverQuery /v ' . you may get some idea. for more vista troubleshooting and guide visit this vista tips blog. If you did a clean install of Windows XP Vista has nothing to do with this problem. I infrequently have problems with Dell drivers not working but when I do its because I've installed the wrong ones. I have gone down the wrong troubleshooting path several times because the driver said it installed correctly..... I noticed that when you go to the Inspiron 6400/E1505 download page (http://support.dell.com/support/downloads/index.aspx?) you have the choice of selecting drivers from lots of OS versions including both 32 or 64 bit versions of XP. I would verify that you have the write driver versions and try again. Another alternative is using the drivers and tools CD that typically comes with a Dell. You can run that and it should have XP drivers. If you don't have the disk you can also try getting the network card running, connect to the Dell site and running their driver ID wizard to ID the drivers you need. Let us know if you have any other questions and please don?t forget to rate this post. If I were in your place I would go back, format the hard drive again and reinstall the OS from scratch. I would stick with the Dell supplied drivers from the CD they sent with the laptop and stay away from manufactures drivers. Take it slow, install one driver then verify its functionality then do the next. The latitude D600 I just finished refurbishing had some weird behavior initially, unexplained error messages at boot up, driver issues and general sluggishness after I installed the driver package. I reformatted and did everything from scratch and the problems went away. If I were in your place I would go back, format the hard drive again and reinstall the OS from scratch. I would stick with the Dell supplied drivers from the CD they sent with the laptop and stay away from manufactures drivers. Take it slow, install one driver then verify its functionality then do the next. The latitude D600 I just finished refurbishing had some weird behavior initially, unexplained error messages at boot up, driver issues and general sluggishness after I installed the driver package. I reformatted and did everything from scratch and the problems went away. In your case, im assuming you refer to the "Vista sticker" that is on the laptop. If a computer is vista-compatible this doesn't mean that it is not able to run older Operating Systems (such as Windows XP SP2) as well. The sticker on the laptop just referes to the type of Operating System that came pre-installed with it. Now if you bought the laptop and asked your salesman for a DOWNGRADE TO XP Operating System or if this is what he understood then it will probably come with Windows XP instead of Vista Home. This also applies if you are working for a company in which case the company's IT Department will decide what type of Operating System is to be installed on this computer. 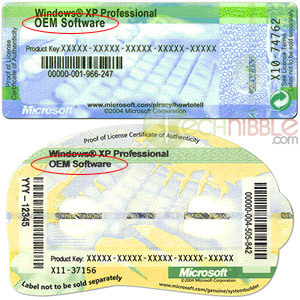 ALSO: Check for the OEM sticker in the back of the laptop or bottom (it looks like THIS for XP or THIS for windows vista Home Premium). This determines whether you can use a vista DVD to upgrade your computer later from XP to Vista. How can I do to install Win XP instead the Win Vista default installer on this computer??? Downgrade... Do I need special tools, sata drivers or something special to do the job..???? Do you have a valid XP license and media? To load an O/S you don't need tools, just software. However, before you load the new O/S, ensure that you backup all your data from your Vista laptop. Once you insert the media, it will guide you. I recommend reformatting the hard drive and then install the XP O/S. I also advise you to go to the laptop mfg website and download all the drivers for XP available for your particular model and put them on a thumbdrive, you willl need them after installing XP. After installation, check your drivers to see what is needed, more importantly the LAN driver may require an update in order for you to get on the internet. Once you are online, you can begin to download all the patches and security updates from MS. Your trying to downgrade this means you have to use vista cd to format the hard driver, and after the laptop restart, load the Xp. Also sometimes this code comes if you donot use the original xp windows. Yes do not downgrade or you Will have problems. Microsoft is planning to stop support for xp in the future and already have a new OS-7 coming out to replace vista. A lot of software that does not say it is for xp will work on vista. Just because it does not say for vista does not mean it will not work on vista. Good Luck. I love Xp too but I will not downgrade to go back because microsoft is only going to make it obsolete in the future. please rate my thank You. Windows Vista will not allow you to install Windows XP software over it. Microsoft has programmed it to not allow anyone to downgrade, basically because there are so many problems with Vista that they would lose money if everyone downgraded. So the only way to load Windows XP is to find you some software that will wipe your hard drive clean. You should be able to do it with the "fdisk" command at the DOS prompt. But beware; this will compeltely delete everything off of your drive. So back up any files that you need. Then you can load Windows XP. Don't forget to rate this solution with 4 stars before logging out.